When I was a kid, I used to play a game like this. Match the Domino pieces so their numbers match to each other and if you have a double, you can lay it vertically instead of horizontally. Domino Box gives you 3 rule sets, a bunch of pieces and a customizable board, but is it fun? Does it entertain? 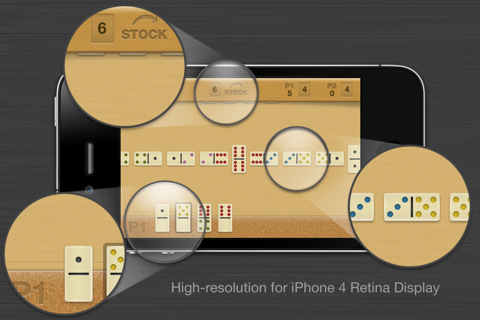 Released by Renato Pessanha, Domino Box is available on iPhone, iPod touch, and iPad for $0.99. Graphically, you get some nice Domino skins, board designs, and a pretty well done user interface. Text fonts and color scheme make this easy to look at and allows for long games since your eyes won’t hurt. Just tap a domino that matches the number. If you don’t have any dominos to add, ‘draw’ another and try. The goal is to reduce your hand to 0 by using all your dominos strategically. You know? When I was kid, I was allowed to get away from making a constant straight line. Align upwards, downwards, left and right, branching and blocking paths completely, all from the base starting point. That was interesting and almost war-like in terms of taking territory. Then again, I am pretty sure that we were playing wrong, but I will tell you, it was a lot more entertaining than this. Even the loading screen shows this, but it’s not in the game itself. Here, you just match the number. The AI will sometimes have the lucky hand, sometimes you will. Because you have such a limiting formula of constantly making one long line, you only really have 2 options at all time; one end’s number or the other. That’s all. The strategy element is gone besides trying to predict what Domino numbers your opponent is holding, but in the end, I beat the opponent without much thought at all. Overall, I liked the presentation but the gameplay was lacking. I really wished for more variety coming from an app that calls itself a Domino Box. Can’t I play with the Domino Effect? Can’t I drag-drop-rotate the tiles and place them on the field any way I like? It could be like a digital form of real dominoes… which was kind of what I was expecting from this game. Nice game however, just wasn’t enough to make me feel like this is a must-play. 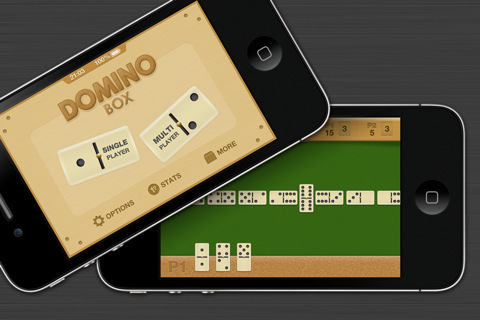 AppSafari review of Domino Box was written by Joseph Ho on November 9th, 2010 and categorized under App Store, Games, Multiplayer, Resource Management, Strategy. Page viewed 3922 times, 1 so far today. Need help on using these apps? Please read the Help Page.